Hello Loverlies! 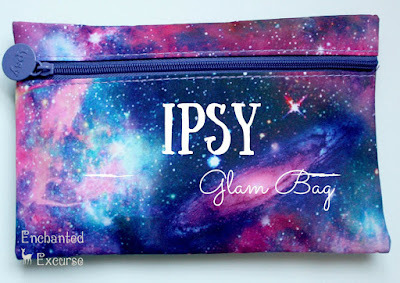 I recently tried Ipsy. Ipsy is a beauty subscription box. You get about 5 items in a makeup beauty bag each month. First thing I will have to say is, I do not like that they use DHL to deliver the bag. I had so much trouble getting my items I paid for. First it was sent here to my town, then it was sent twice to a different town where it stayed there for quite a few days. It was just too upsetting I canceled my subscription and now I am with Birchbox. We shall see if Birchbox does better. Have a Blessed Day! This mascara wasn't really a wow factor for me. It just seemed to be your normal mascara. Also the wand was huge. I enjoy Almay's mascara's better. This is a primer before our base foundation. It is supposed to help your skin not be as shiny I believe. At the end of the day my face was shiny sadly. Also I would rather it be unscented, because it smelled of perfume. And not just a light scent either. The other thing about this is, you have to use a little more than you think you would to cover your whole face. Maybe it will be better for folks who don't have as oily skin as I do. Although I was hoping it would work for my skin. My eyes tear up most of the time because of allergies. So sometimes it is hard to put on eyeliner. I was having trouble at first but once I got it on my eye lids, it actually stayed on all day. The navy eye liner look isn't too noticeable or bold either. Which is a good thing if you don't want the color to show too much. I have only used this once because I don't really have dry skin. When I did use it there is no little goes a long way, and it seemed to make my skin feel more dry. It also had a burning feeling to it, which is odd because it says it's for sensitive skin. Maybe i'ts different for folks who have dry skin. But I know I would not enjoy purchasing this product. The eyeshadow I am using is from CoverGirl. It is Notice Me Nudes. You can find it HERE.